When night falls in Haiti, it's time for stories. The storyteller says kric, the audience responds krac, and all of the children become very excited. This collection brings you wonderful treasures from a country that is rich in spirit and culture. Through lively tales remembered from childhood, storyteller Liliane Nerette Louis shares with readers and listeners the warmth, fondness, and humor of her beautiful and mysterious homeland. 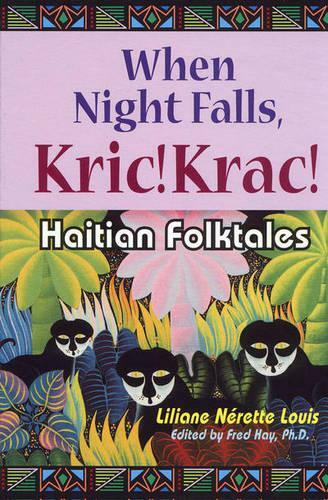 The 28 tales are arranged by subjects and themes-Bouki and Malis (mythical characters in Haitian folklore); stepmothers; animals; kings and princes; ghosts, zonbi, and tonton makout; and love and courtship. Louis also shares a variety of tantalizing, traditional recipes. In addition, a historical background, color and black-and-white photographs, and line drawings are included, making this a valuable resource for educators and students.